There’s little moreromantic than a place accessible only by boat, foot or perhaps a swimming horse. 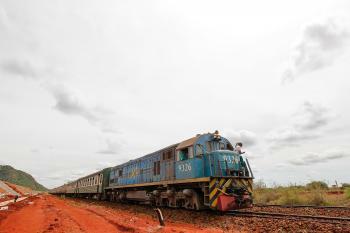 This kind of narrow-gauge tourism is what sets Caraíva apart from the run of increasingly discovered resorts up Brazil’s Bahian coast. 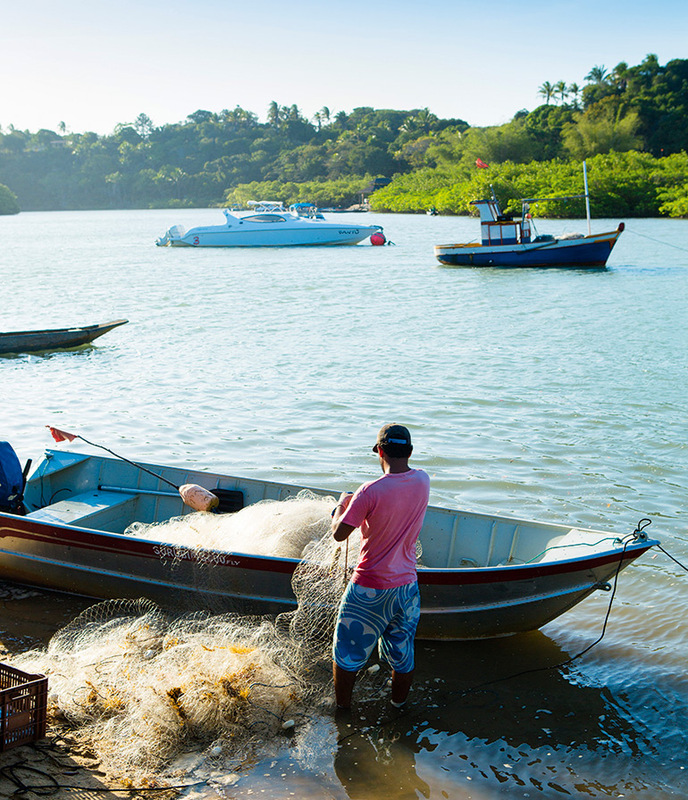 A low-key fishing village at the end of a rutted dirt road, it’s hemmed in by Monte Pascoal National Park (a 22,383-hectare coastal rainforest reserve) to the south and the adjacent Porto do Boi reservation belonging to the Pataxo Amerindians. From where the road ends, access is by punt only, operated by local ferrymen who carry visitors across the river, which snakes through rainforest into the heart of Caraíva. Here, sandy streets just wide enough for a mule and cart lead down to a caster-sugar beach. At night, the only light comes from open shutters, the only noise from the rumble of waves and the beat of the forró drum, seeping out of the only bar in town. 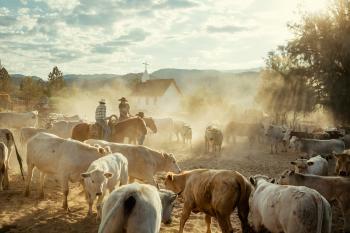 In the 1970s, it was much the same in Trancoso, Caraíva’s neighbour a 90-minute drive up the coast. 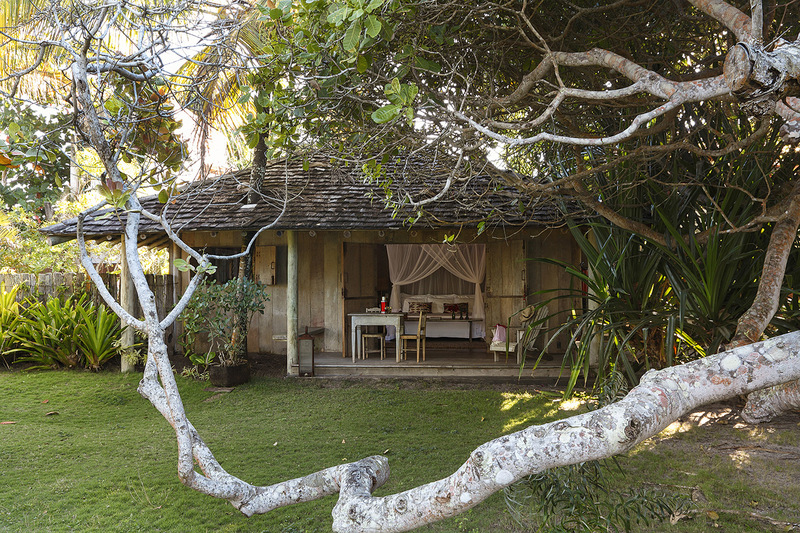 Before Brazil’s growing wealth turned it into a land of glossy condominiums and luxury hotels, Trancoso encapsulated the beatnik dreams of São Paulo intellectuals fleeing the military dictatorship. 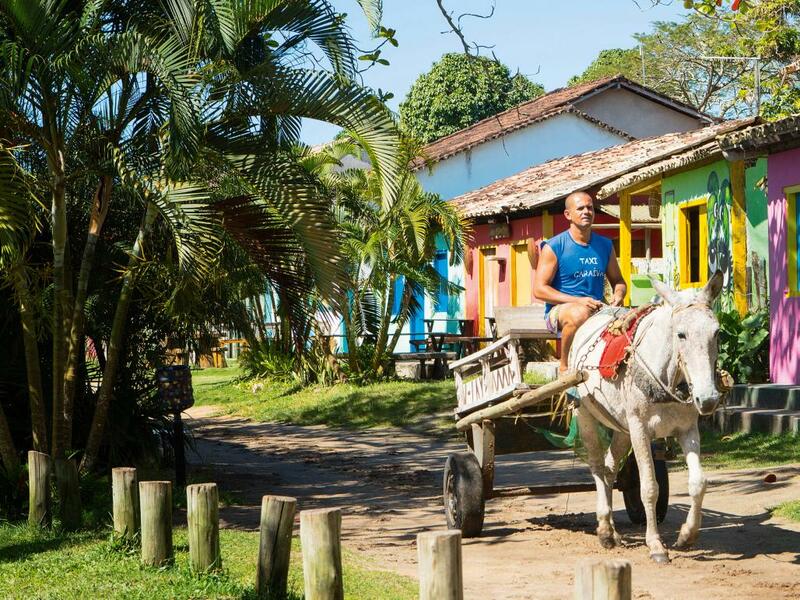 Drawn by notions of a mythologically pure land, these early-day hippies colonised Trancoso, with its tangerine- and peppermint-coloured houses, and Porto Seguro, just to the north. These days Trancoso has a Lear-jet runway and, like Ibiza, it has evolved from soulful roots into a place where flip-flops and diamonds go hand in hand, and beach-shack bistros serve simple grilled seafood and vintage champagne. Not so Caraíva. 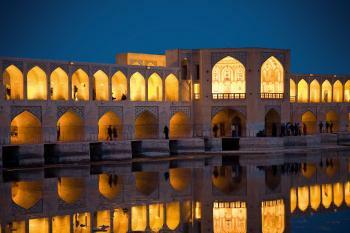 The village sits between a winding river, lined with mangrove and mangaba trees, and an 8km-long crescent of golden sand. Between December and May, sea turtles surf in the waves to lay their eggs on the beach. In the southern winter months, calving humpback whales swim in the ocean beyond the reef. 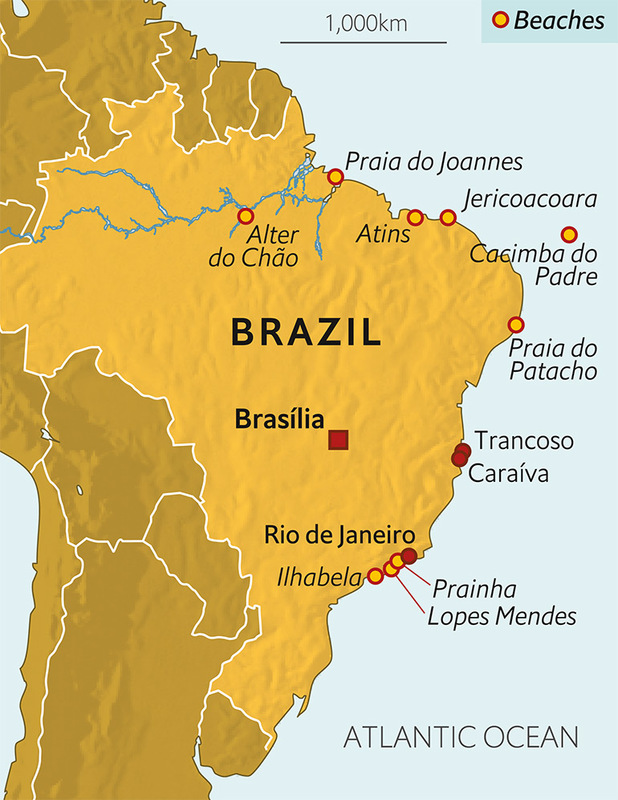 Immediately to the west of the village is the pyramid peak of Mount Pascoal – the first Brazilian landmark sighted by the Portuguese caravels in 1500. Puma and ocelot hunt in the thick forest of Monte Pascoal National Park which spreads around the mountain’s base, forming a tongue of misty green that meets the coast at Corumbau cape, just to the south of Caraíva. Within the village, a few of the painted fishermen’s huts have become pretty pousada guesthouses and restaurants serving chilli-spiced, coriander-rich coconut soups and tangy acarajé falafel, but the river still bobs with old-style fishing boats. 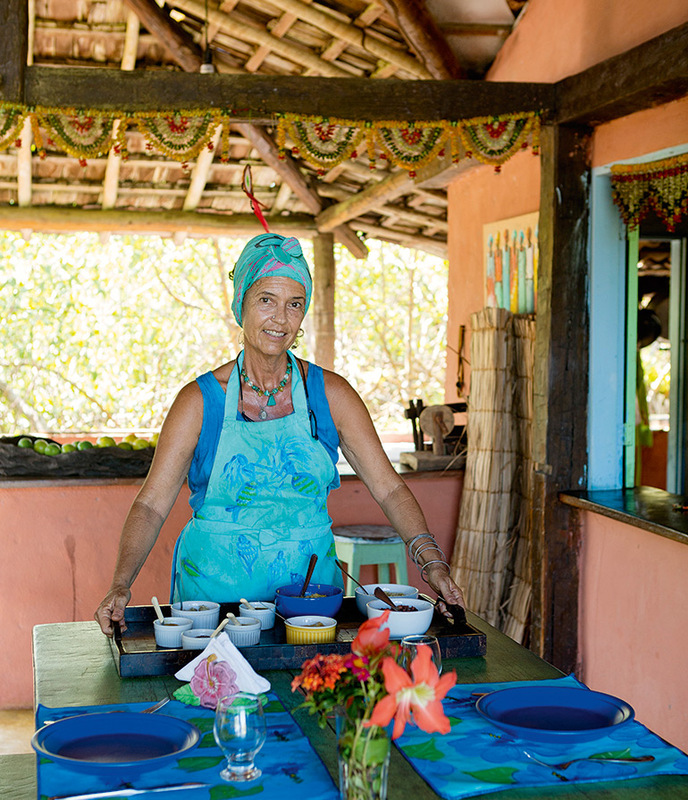 And while Trancoso’s streets are dominated by southerners clad in Osklen (Brazil’s version of Ralph Lauren) and Lenny Niemeyer bikinis, Caraíva feels down-to-earth, a community of locals not yet outnumbered by the blow-ins. The best place to stay is, without question, Villa Mangrovia, two palm-thatch beach houses backed by a lawned garden of coconut palms and bougainvillea. The beds face eight-foot-high shutter windows, which open directly onto the sand. Decoration is raw but stylish: buriti palm mats, chunky weathered-wood furniture, woven wicker, blue, crimson and orange cotton cushions. It’s a place for travellers who can handle geckos in the bathroom and no television, and who don’t mind walking barefoot in the garden or muddling through with staff in pidgin Portuguese. Seventy per cent of the money generated by stays at Villa Mangrovia goes directly to the owners’ NGO, Caraíva Viva, which funds, among other projects, a women’s group producing elegant beachwear sold in the local boutique, Loja. This shop sits on Caraíva’s only commercial street, the Rua da Ribeira, a huddle of blue, green and terracotta sugarcube-shaped cottages overlooking the river. Here you’ll find Gahyia cosmetics selling soaps and body lotions fragrant with musky almescar (made from the sap of a local rainforest tree), lemongrass and pitanga berry. The Bar do Porto next door serves crispy pizzas and tangy caipirinhas, and has forró dancing on Saturdays. Boteco do Pará, a few doors up, is a waterside nook serving the best food in town including moqueca, a spicy coconut and dendê-oil broth cooked with fish caught off Caraíva’s fringing reef where, in the last light of day, surfers mount their boards to catch the cresting Atlantic waves. There are daily flights with TAM (tam.com.br) from Rio (60 minutes, from $165 ) and São Paulo (1hr 45mins, from $170). Mata N’ativa Travel (matanativapousada.com.br) offers airport pick-ups in Porto Seguro, a night in the Mata N’ativa pousada in Trancoso and a full-day speedboat journey to Caraíva the next day from $260 per person for minimum of two people, full board. In Caraíva, local boatman Ivan de Sousa Sisnande (book through Villa Mangrovia; day trips from $70) leads canoeing and stand-up paddle tours along the forest-fringed river, and motor-boat trips to far-flung beaches, including Espelho, where there is an excellent two-table restaurant, Sylvinha’s (+55 73 9985 4157; sylviaespelho@yahoo.com.br; no website; lunch from $35) for freshly caught octopus. Book Villa Mangrovia through brazilianbeachhouse.com, rent from $2,200 per night for up to 12 guests. Prainha, Rio de Janeiro: A secret cove a 20-minute drive from the Olympic park. Empty on weekdays, busy on weekends. Atins – Lençóis Maranhenses, Maranhão: On one side, a 100km desert; on the other, endless beaches and shallow lagoons frequented by scarlet ibis. Jericoacoara, Ceará: The Trancoso of the far north-east – beachside restaurants, starlit nightlife, dunes, kilometres of empty sands and possibly the best kite-surfing in the Americas. 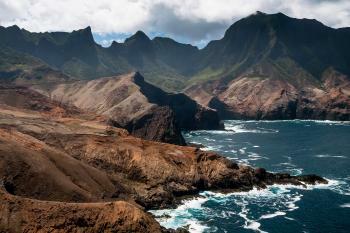 Cacimba do Padre, Fernando de Noronha: Unspoilt beach with world-class reef-diving and surf-championship-quality waves. Alter do Chão, Amazon: White sand lining a vast, clear blue river where bubblegum-pink dolphins play. Praia do Patacho, Alagoas: Gentle waves, reef pools filled with fish, and good eating – at Pousada Xuê, by Guido Migliorino. Lopes Mendes, Ilha Grande: A 3km-long sweep of sand backed by rainforest and reached by a forest trail. A hotspot for backpackers of all ages. Praia do Joannes, Ilha do Marajó: A shaded beach patrolled by police on buffalo-back and set on a river island the size of Switzerland. For sheer exoticism, no other Brazilian beach comes close. Ilhabela, São Sebastião, São Paulo: This forest-covered island fringed with coves of sugary sand pounded by bottle-green waves is an easy weekend escape from São Paulo.